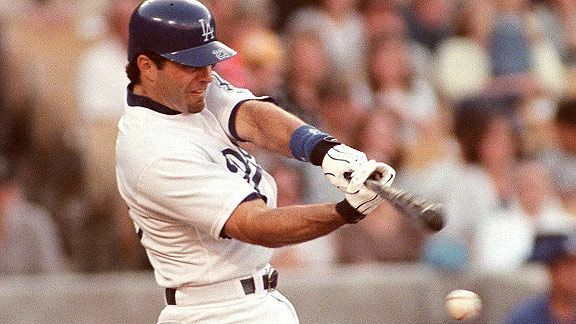 Eric Karros of the Dodgers connects for the game-winning hit in the ninth inning of the Dodgers’ 13-12 victory over Florida at Dodger Stadium on April 29, 2000. Dodgers at Mets, 10:10 a.m.
Tony Jackson of ESPNLosAngeles.com has the lowdown on Ned Colletti’s critical comments of the Dodgers’ play. (Dodgers Blog has Kemp’s response.) I’ll agree with Colletti that Matt Kemp’s basestealing and defense have been a disappointment that we’d all like to see corrected, but if you’re going to start throwing out pointed comments about the effect of his new contract, you might at least balance it with the fact his hitting has been MVP-caliber. The Dodgers are not losing because of Matt Kemp. Jackson adds, as many of you might already have suspected, that Charlie Haeger’s roster spot is in jeopardy after another unsatisfactory outing. Not sure what move the Dodgers would make, but Saturday might bring a decision. On April 29, 2000, I stood at one end of a room and a woman walked toward me from the other end of the room. And then we made vows, and we walked out of that room together, married. I’m not sure what’s more amazing – that it ever happened, or all that has come in the nine years and 364 days since. It feels unreal. It’s been very real – family life can be bliss and it can be hard. But thinking about it feels unreal. It’s a ride I don’t want to get off. So I’m off to celebrate – you’ll next see me here Friday or Saturday. There will game chats, so stick around and think good thoughts about the Dodgers, when you can. James Loney can’t believe tonight’s strike three call against him – nor the downward slide of the Dodger season. 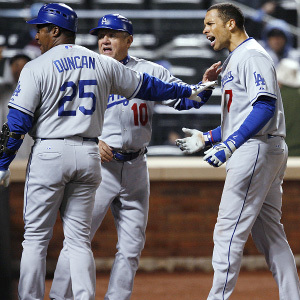 So far in 2010, these Dodgers have been something – as in, it’s always something. With their 10-5 loss to the Mets in the second game of today’s doubleheader, the Dodgers now have the worst record in the National League – tied at 8-12 with Atlanta and Pittsburgh, which won the season-opening series between the two teams. Not for lack of effort, the team has simply found a way to lose. 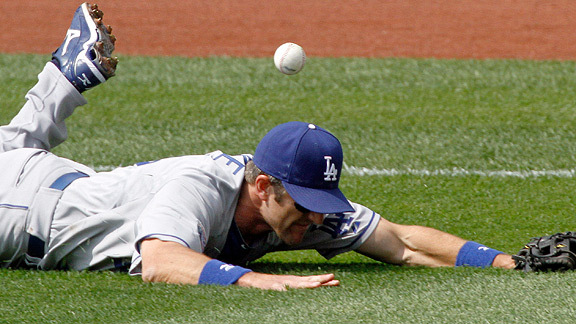 The Dodgers aren’t loafing, but they’re not executing – not enough of them for long enough. You could say there were turning points today, if you could also say there are turning points when you’re sitting in a dunk booth. I don’t think the Dodgers take the field defeated, but they’ve left me feeling that way. Lately, wins feel like aberrations. They get bad breaks – the lowdown called strike three on James Loney with the bases loaded and two out in the top of the fourth tonight made the Dodger first baseman angrier than most of you have probably ever seen. But everyone gets bad breaks. They get hurt – three Dodgers to the disabled list in the past week, and now Rafael Furcal’s health is back in doubt, reports Tony Jackson of ESPNLosAngeles.com. You can’t win if you can’t stay healthy. They’re out of sync – pitching, defense and hitting almost never working at once. Wednesday marks the end of a nine-game roadtrip that has already yielded six losses. We’ll see if home cooking this weekend helps fix things; we’ll see if the Dodgers are getting their bad fortune out of the way early. Time and potential are on the Dodgers’ side. The question is whether reality is. 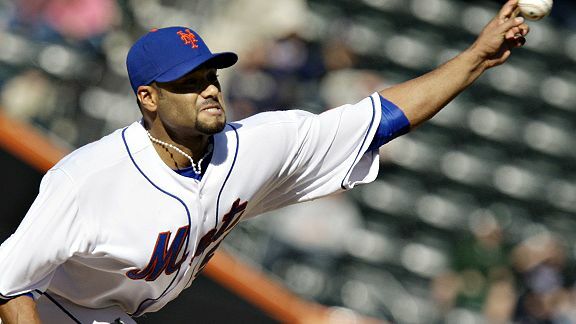 Johan Santana was on the wild side for New York today, but he got the job done. Dodgers at Mets (Game 2), approximately 4:30 p.m.
And so the reversal is fully in motion. The Dodgers get their third consecutive quality start, this time from Hiroki Kuroda. But the offense is shutout for the second straight time, and Los Angeles falls in the first game of their doubleheader today against the Mets, 4-0. It wasn’t a cruise for Mets lefty Johan Santana. He needed 115 pitches to battle through six innings, including a second inning when he walked the bases loaded, but twice used Kuroda as an escape out of a jam and left the game unscored upon. On one level, Kuroda outpitched Santana, needing only 87 pitches over six innings, but a wild pitch got the first run in for the Mets in the second, and Jason Bay’s first homer of the season (in the fourth) brought in the insurance. I was hoping that with such a low pitch count, Kuroda would stay in the game (and sacrifice) with one out and one on in the top of the seventh, but Joe Torre had Garret Anderson pinch-hit. The Dodgers didn’t score, and rookie Jon Link came on to pitch the bottom of the seventh, allowing the first three men to reach. The Dodgers then brought in Ramon Troncoso; why you would make Troncoso available but not use him to start the inning, I don’t know. Anyway, the Mets scored two runs to double the Dodger deficit. You’re never confident against Santana, but you know, you’re starting Hiroki Kuroda, and then he’s pitching well, Santana looks fallible, and suddenly the game looks completely winnable. But then a different reality blindsides you. For your between-game reading (via Baseball Musings): former Dodger minor leaguer Matt White isn’t a billionaire after all, but he’s still looking good for his post-baseball life, according to this story (which I’m having trouble really originated on the Granite Transformations blog, but that’s the only place I could find it). 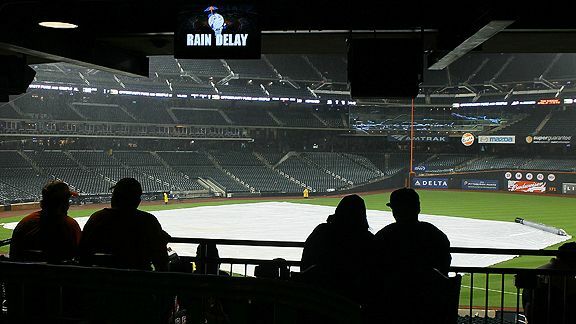 Citi Field fans wait out a rain delay during the sixth inning of the game between the New York Mets and the Atlanta Braves on Sunday. Dodgers at Mets (Game 1), 1:10 p.m. Spontaneously delivered to us by Coach Nature, Hiroki Kuroda vs. Johan Santana is a pretty great matchup for the first game of today’s doubleheader. But the Dodger press notes point out that the last time the Dodgers played a straight doubleheader in New York, on August 14, 1990, the Game 1 matchup was Dwight Gooden vs. Ramon Martinez. Final score of that one? Mets 9, Dodgers 8, with both starting pitchers allowing seven runs. Howard Johnson was right … on with a three-run homer in the first inning, giving the Mets a lead they never quite relinquished despite three hits and four RBI by Dodger leadoff-hitting third baseman Lenny Harris. Vicente Padilla has an irritated radial nerve in his right forearm. The Dodgers say they have not set a timetable for his return; True Blue L.A. has more details about the injury, including a reference point with Tampa Bay’s Matt Garza, who spent 16 days on the disabled list with it in 2008 but came back strong. The Dodgers have been rained out at New York tonight, with a doubleheader scheduled for Tuesday beginning at 1 p.m.
Hiroki Kuroda will start one game; the second will be either by Charlie Haeger or a minor-leaguer. (Unless Haeger starts both games!) John Ely was scratched from his Albuquerque start tonight, so he is most likely to make his major-league debut either Tuesday or Wednesday. Is it time for the Dodgers to hire Chad Moriyama of Memories of Kevin Malone as pitching coach? You be the judge. Former Dodger exec Charles Steinberg has officially become MLB commissioner Bud Selig’s senior adviser for public affairs, reports Chuck Schilken of the Fabulous Forum. Update: Kuroda vs. Johan Santana in Game 1; Haeger vs. Oliver Perez in Game 2. The weather report for gametime in New York tonight is not looking good — unless you’re rooting for an off day. Chad Billingsley averaged 14.3 pitches per inning today. If there is a feel-good loss, the Dodgers might have felt one today. Despite being shutout for the second time in eight games and again falling two games below .500, the Dodgers and Chad Billingsley might be moping less than normal after the righthander delivered his best start of the year Sunday, allowing one run over six innings in the Dodgers’ 1-0 loss to Washington. With runners on first and second, Billingsley went 2-2 to Josh Willingham before getting him to ground out and end his cleanest outing since September 23 at this same ballpark, when he pitched no-hit ball for 5 2/3 innings before giving up two walks and a three-run homer to Ryan Zimmerman. 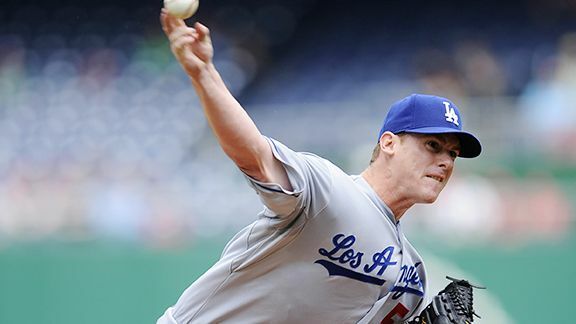 Had the Dodgers been leading – which would have been a possibility had they converted three consecutive one-out singles in the first inning into a run – Billingsley would certainly have pitched in a seventh inning for the first time since July 5. But down by a run with a runner on first, Joe Torre pulled Billingsley for pinch-hitter Andre Ethier. Ethier grounded into a double play. After Ramon Troncoso retired six of seven players he faced in the seventh and eighth innings, the Dodgers had one final chance when James Loney (2 for 4) led off the ninth with an opposite-field double. But pinch-runner Jamey Carroll couldn’t advance on Casey Blake’s, I don’t know, confusing one-hopper to Guzman. Justin Maxwell then made a diving catch on Ronnie Belliard’s blooper to right, and Anderson wrapped up a miserable, three-strikeout day with an easy pop to center. It’s just one game in the season for Billingsley, but it was a promising one. The only time things really went wrong for him was when the leadoff single by Nyler Morgan was followed by an ugly four-pitch walk to Adam Kennedy. But between then and two outs in the sixth, Billingsley only one three-ball count and scattered two singles. Though no one likes a 1-0 loss, the Dodgers might hate this one a little less. Above, Ken Levine passes along a fun promo for Vin Scully’s 1967 Rose Parade co-hosting gig with the bewitching Elizabeth Montgomery. We know Scully’s voice can cut through time and space, but this is ridiculous! In contrast, while I share the Left Field Pavilion’s disappointment at how many non-Dodger events are included in this MLB Network tribute to Scully, it’s all worth it for the pictures of Scully hitchhiking. Yes, hitchhiking. The somewhat press-shy Andre Ethier gave a fairly lengthy interview to Steve Greenberg of SportingNews.com. Red-hot Jerry Sands of the Dodgers’ Class A team in Great Lakes is profiled by Hugh Bernreuter of the Saginaw News. Sands hit two homers Saturday to up his season batting average, on-base percentage and slugging percentage to .443/.500/.967. John Lindsey Watch: In Albuquerque’s 6-2 victory over Omaha on Saturday, Lindsey homered and singled in five at-bats, which meant his season batting average and on-base percentage fell to .500 and .548. His slugging percentage did tick up to .821. By comparison, Isotopes third baseman Russ Mitchell went 3 for 5 and is up to a .359 OBP and .446 slugging. Ivan DeJesus, Jr. had been struggling at Albuqerque, so his 3 for 5 came in handy. His overall 2010 offense still remains down in the .277/.323 dumps. Carlos Monasterios, right, gets a high-five from Russell Martin, center, and Matt Kemp after the Dodgers defeated the Washington Nationals 4-3 in 13 innings Saturday. Monasterios isn’t going anywhere for a while after his 2 2/3 extra innings of shutout ball. See what happens when you get two out of three cogs working? The Dodger defense help cause the team to play four extra innings Saturday, but this time the bullpen was up to the task while the offense did just enough. With Carlos Monasterios getting the final eight outs, the Dodgers defeated Washington in 13, 4-3. The glow was tempered a bit with the news that Vicente Padilla was going on the 15-day disabled list with right forearm problems – the third Dodger to go on the DL this week. Reliever Jon Link has been recalled, but the Dodgers will make another roster move by Tuesday for a starter to take Padilla’s turn in the rotation. But there was a glow nevertheless. Clayton Kershaw (3.13 ERA in 2010) allowed 11 baserunners in six innings but went to the showers with a 3-2 lead thanks to Casey Blake’s second home run. However, a Russell Martin throwing error – the 20th of the Dodgers’ 17-game season to date – led to an eighth-inning entrance by Jonathan Broxton, who allowed the game-tying, unearned run (charged to Ramon Troncoso). Rafael Furcal’s error an inning earlier also caused trouble; the Dodgers used four pitchers to get six outs in the sixth and seventh. But the Dodger bullpen provided five scoreless innings at a most welcome time, with Broxton pitching the ninth, George Sherrill retiring all four batters he faced and then Monasterios (his ERA shrinking to 2.08) providing the final 2 2/3 innings to end it. It wasn’t without one more scare. Monasterios entered the bottom of the 13th with the one-run lead after Russell Martin (0 for 5 with the big error at that point) singled in Furcal, who had singled and stolen his eighth base in nine attempts this year (second in the National League). Monasterios allowed a one-out single to pinch-hitter Ivan Rodriguez and then a double to the right-field corner by Nyler Morgan. A faster player would have scored, but Rodriguez held at third – and then was thrown out at the plate by inches by Blake on the Nationals’ next at-bat. Cristian Guzman then popped out to end it. Monsasterios had come through. The Dodgers had come through. Even though Washington had gotten a runner to at least second base in each of the first nine innings, the Dodgers won. Monasterios, 24, generally keeps his emotions in check on the field but was jumping up and down in the infield like a Little Leaguer when he got Guzman to fly to left and end the game. With James McDonald on the AAA disabled list because of a broken nail (“Why tonight?”), the leading candidates to take the Tuesday start are John Ely, Scott Elbert and Josh Towers. Ely and Towers would require a 40-man roster spot, which the Dodgers have to spare if they move Brad Ausmus or Cory Wade from the 15- to the 60-day DL. Ely has the best numbers of the three: a 3.00 ERA over three starts covering 18 innings, though he has allowed 16 hits and eight walks against 12 strikeouts, and he’d be on five days’ rest for Tuesday. McDonald could be activated from the DL next week, but would the Dodgers use him after the layoff he has had? Elbert, who last pitched for Albuquerque five days ago and was scheduled as recently as Friday to pitch today, was replaced by Seth Etherton, so one might have concluded he’ll get the call despite allowing 13 runs in eight innings over his past two starts. (He pitched six shutout innings in his first start of the year.) But Eric Stephen of True Blue L.A. points out that Elbert is with his wife for the birth of their second child, so who knows? Also keep in mind, with the possibility of a rainout Sunday or Monday, the Dodgers might be able to postpone addressing this problem. Anyway, enjoy today’s glow – a nice alternative to what could have been another dastardly disappointment. 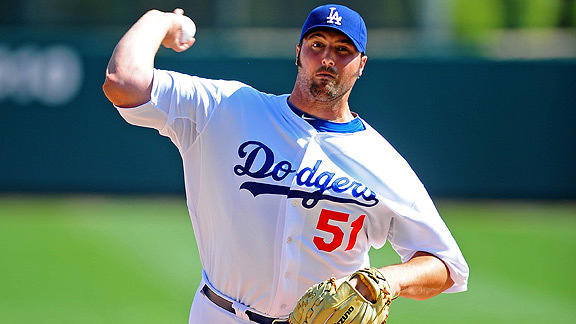 Jonathan Broxton is the only impeccable Dodger pitcher this season, but he has only pitched 5 2/3 innings in 2010. Ooh, child, are things gonna get better? With the Houston Astros (6-10) on Friday winning their fifth game out of six, and Philadelphia and St. Louis losing, the gap between the top and bottom teams in the National League has shrunk to four games. By the end of the day, there’s a chance that the Dodgers (7-9) could be part of of a three-way tie for the worst record in the NL – or a three-way tie for third place in the NL West, two games out of first. That should be enough to indicate how early in the season it is. But I offer that up as much for me as any of you. I’ve been disgusted by the pitching and the defense. So far this season, the Dodgers have only twice strung together as many as eight shutout innings: April 7 at Pittsburgh (in between giving up three runs in the first and the winning run in the 10th) and April 17 (2)/April 18 (6) against the Giants (the Dodgers won the second game). Four other times, the team has had at least five consecutive scoreless frames. That’s it. Eric Stephen of True Blue L.A. writes, “The Dodgers lead the majors with 14 unearned runs allowed this season. In 2009, they didn’t give up an unearned run until the 20th game of the season.” One’s stiff upper lip quivers when the pitching and defense are that porous. The offense is working, but we all know you need more than that. If the Dodgers can get their fielding above abysmal (Dodger Thoughts commenter Regfairfield has pointed out that the rate of mistakes they have made in 2010 is essentially unprecedented over a full season) and at least get the pitching to be competent, that will be enough for now. As you can see from the first paragraph, no team has broken out in the NL – Philadelphia and St. Louis have their issues, and the NL West is led by the team predicted to finish last. There’s plenty of time. If the offense unplugs while everything else remains sloppy, however, then this season turns into a disaster and, looking ahead to next year, puts much of the entire roster up for grabs while the McCourt divorce case drags on. As we sit here today, there might be as few as four players the Dodgers will definitely retain for 2011: Andre Ethier, Matt Kemp, Clayton Kershaw and Jonathan Broxton. Russell Martin and Rafael Furcal are likely to stay off the trade market if they can enough of their April performance. Everyone else … who knows? Some would have to stay, but they’d all be on the table. It doesn’t really matter who – it would still be turmoil. It’s too soon to worry about this, but I do worry. But it’s too soon. But I worry. But it’s too soon. Based on this Washington D.C. forecast, the Dodgers should avoid a rainout. No Dodger reliever except Ramon Ortiz was used Friday. 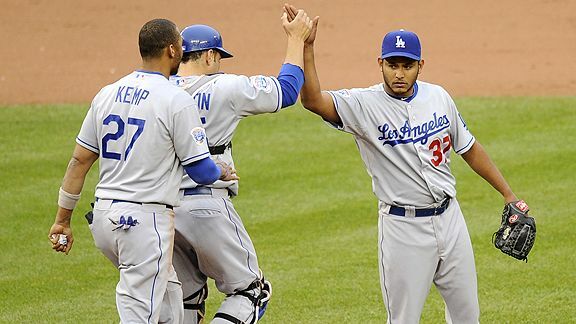 The Dodger reliever with the lowest ERA this season (minimum six innings): Carlos Monasterios, 3.00. Xavier Paul is starting today, but this brief from Ken Gurnick of MLB.com indicates he will be out there in the first inning only occasionally while Manny Ramirez recuperates. Despite Garret Anderson hitting a pinch-homer Thursday, I think the Dodgers would be better-served giving Paul most of the starts. It’s not exactly the same problem as Chad Billingsley, but wun-time onederkind Cole Hamels is being heavily scrutinized in Philadelphia. Inland Empire’s Ethan Martin pitched six innings of two-hit shutout ball Friday, walking three and striking out seven, in the 66ers’ 1-0 loss. Martin’s 2010 ERA is 1.80. With two shutout innings in relief, Kenley Jansen has a 0.00 ERA and 18 strikeouts against 10 baserunners in 10 2/3 innings this season. Jerry Sands went 3 for 4 in Great Lakes’ 2-1 10-inning loss. The 22-year-old Sands (he’s about six months older than Kershaw) has a .485 on-base percentage and .879 slugging percentage this year. Garret today, Xavier the Savior tomorrow? 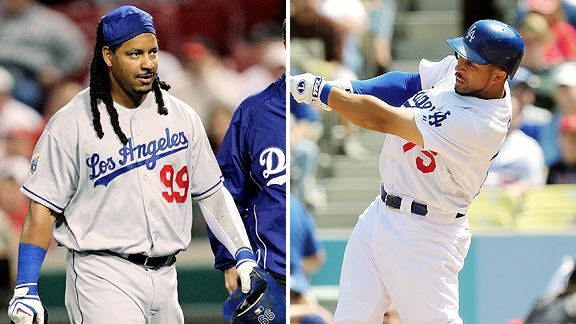 At 1 p.m., the Dodgers announced that Manny Ramirez would be placed on the disabled list with a right calf strain and that Xavier Paul would be recalled to join the active roster. Paul has a .409 on-base percentage and .574 slugging percentage in 66 plate appearances for Albuquerque this season. The Dodgers lost tonight, and if you don’t know how, you can probably guess. Casey Blake has three errors in 11 starts, though none of his errors have affected the game’s outcome. Can Padilla push team over .500? Here’s a quick rundown of the Dodger errors and their effects this season. In 14 games, the team has made 16 errors, leading to 12 unearned runs. Three of the errors have contributed directly to losses. Error: Tied 2-2, with runners on first and second, Martin bobbled Zach Duke bunt in front of home plate. Consequences: No runs, seven extra pitches thrown by Vicente Padilla. Error: Down 8-5, with bases empty and one out, Blake flubbed Jeff Clement’s grounder. Consequences: No runs, three extra pitches thrown by Russ Ortiz. Error: Tied 3-3, first batter of the inning, DeWitt commits miscue on Lastings Milledge grounder. Consequences: Milledge sacrificed to second and two batters later scores winning (unearned) run off Ramon Ortiz. Error: Leading 8-1, one out and bases empty, third baseman Belliard allows Andrew McCutchen to reach on a grounder. Consequences: Ramon Troncoso induces 4-6-3 double play from next batter. Error: Leading 8-2, one out and runner on second, Adam LaRoche takes advantage of another Belliard mistake. Consequences: Carlos Monasterios retires next two batters, two extra pitches required. Error: Tied 0-0, leadoff batter Cody Ross reaches on Blake mistake. Consequences: Hiroki Kuroda retires next three batters, one extra pitch required. Error: Tied 0-0, Martin throws away Cameron Maybin bunt (single plus error). Consequences: Kuroda allows one-out single to Jorge Cantu for unearned run. Needs three extra pitches to get out of inning. Error: Leading 5-3 with bases empty and two out, Kemp misreads shallow Ronny Paulino fly ball, dives for it but bobbles it for two-base error. Consequences: Charlie Haeger allows RBI single for unearned run, then a walk before getting a groundout to end inning. Nine extra pitches. Dodgers ultimately lose, 6-5. Error: Trailing 1-0 with runner on second and and two out, Furcal throws away Conor Jackson’s infield single. Consequences: Jon Hester comes around to score unearned run; Tony Abreu extends Kuroda for eight pitches before grounding out to end inning. Error: Arizona leads 4-3 with runners on first and third and one out when Blake mishandles Abreu grounder. Consequences: Unearned run scores. Dodger reliever Ramon Ortiz called in, needs four extra pitches to get out of inning. Dodgers tie game in bottom of the ninth thanks in great part to a Stephen Drew error, then win in 10th. Error: Trailing 1-0, runner on first, Ellis throws ball away on Aubrey Huff steal attempt. Error: With Huff on third, Carroll (playing shortstop) can’t handle Mark DeRosa grounder. Consequences: Four runs score in the inning — two unearned, thanks to the errors and an Ellis passed ball. Error: Tied 3-3 with no outs and runners on first and third, Billingsley throws away Homer Bailey’s sacrifice attempt. Consequences: Most disastrous defensive play of year to date. Of six runs Billingsley allows in inning, three are unearned. Billingsley needs nine extra pitches to exit inning. Dodgers lose, 11-9. Error: Trailing 7-3, runner on first and two out, Martin throw gets away on Drew Stubbs steal attempt. Consequences: The next batter, Joey Votto, homers off Ramon Ortiz. Runs are earned. Ortiz needs three extra pitches to end the inning. Error: Leading 4-3, runner on first and one out, DeWitt lets potential double-play grounder get past him. Consequences: One out and one Kuroda walk later, Aaron Harang knocks his controversial single just shy of Andre Ethier’s glove for unearned run. Error: Leading 9-4, runner on first and two out, an easy grounder to Furcal somehow gets through. Consequences: George Sherrill replaces Kuroda and gives up a single that scores two unearned runs. Sherrill uses three more pitches to end inning. Error forced the Dodgers to use an extra pitcher in the game. Update: The Dodgers have activated Hong-Chih Kuo and placed Jeff Weaver on the disabled list.